This will allow us to provide legal services on a limited basis to folks who have a willingness to take charge of their legal matter and would like to handle their own divorce with attorney assistance with minimal legal fees. We are thrilled to announce the opening of a second office in Republic, MO. Please tell your friends and stop by or call for an appointment today! 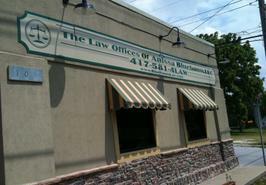 "The Law Offices of Anissa Bluebaum, LLC is dedicated to a community driven General Law Practice. Located in the County Seat of Christian County, Ozark Missouri. We specialize in making your legal representation as personal as possible and pride ourselves in establishing long lasting attorney/client relationships. We go out of our way to make your legal issues emotionally and financially manageable while listening to your concerns and explaining to you every step of the way what the law is and how it effects your legal standing and disposition."